Above: Mussel completely encrusted by the colonial tunicate Botrylloides. Several tube worms living between the mussel shell and the tunicate extend arms into the water. Above: Same mussel, but most of the tunicate coat has been cut away to reveal the bodies of the tube worms. Above: A different clump of animals. A mussel (lower right) is covered by a compound tunicate colon, but its shape tells us it's there. A large club tunicate, Styela clava, has attached to the mussel, and extends up to the top left corner, where you can just see the syphon openings. 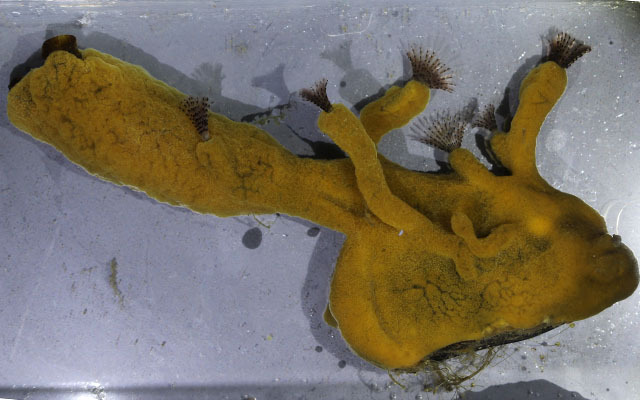 At least six tube worms have grown between the compound tunicate and mussel, and extend arms into the water. I have been taking photographs of The Dock using an underwater camera, and when looking at the images noticed several flower-like animals with many arms extending at least 10 mm from a hidden source. I then spent time just looking over the edge of The Dock to see if I could see the "flowers" in real time; and I did. They were sensitive to light, and if I was not very still the "flowers" disappeared I pulled several clumps of animals that contained these "flowers" and took them back to the lab aquarium. The "flowers" turned out to be the mouths of tube worms. As you remember from LOTD, there are many sizes and types of "worms". One big group belongs to the phyla Annelida, the segmented worms (the common earth worm is in this phylum). The marine tube worms make hard tubes that protect there bodies. On pages 81 and 82 of LOTD I describe two tube worms, but the one I am describing here is a very different species. Winkipedia states that there are more than 22,000 living species of annelids. We will never know the exact number, but there are a lot of worms. It is quite possible that the worms at the right are the Red-trumpet calcareous tube worm, Serpula columbiana, see page 148 of . But then they might not be. If only I had a DNA sequencer I could nail the species. Often the tube worms grow along the shell of a mussel, and only their extended mouth is visible, as seen in the first two images on the right. However, they can also grow out from the solid surface, but their tube body seems to be always covered with some colonial animal, e.g. a compound tunicate. In the 3rd image on the right, a large Styela tunicate (on the left) has attached to a mussel (lower right), and both have been covered by a tunicate colony. The tube worms have grown between the mussel and tunicate walls and the tunicate layer. In some cases the tube worms grow out from the surface, but are still covered by the brown compound tunicate layer. In this case they form tubes which look very much like sponges, particularly when the arms of the tube worms are retracted. While looking at these clumps I could see many other animals that make up the community. Most probably hide between the layers of the larger animal, but a few run around on the surface of the community. Examples are amphipods, such as the Caprellidae on the cover of LOTD. This discussion thread will continue.